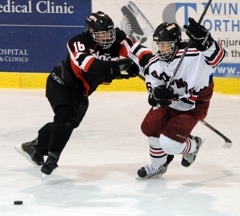 For some teams, a travel-heavy schedule such as the one Duluth East plays would not only be impossible but would spell disaster. For the No. 1-ranked Greyhounds, however, they wouldn’t have it any other way. Sandwiched somewhere in more than six hours of travel time was the Greyhounds' 4-1 win over Lakeville North on Tuesday, Dec. 15. It didn’t seem as though the bus ride affected Randolph, who registered four points (one goal, three assists) -- a performance that wasn't necessarily surprising to the senior co-captian's teammates. Team bonding is something both Randolph and Toninato have enjoyed working on. They've had to do more if it recently as they are playing without loingtime linemate Trevor Olson, who is out until mid-January with an MCL tear. “We have a lot of chemistry with Trevor (Olson) on the line, but with Ryan (Lundgren) on the line we've been working at it a lot in practice and it's getting better,” Toninato said. “There's a couple things we need to work on, but I think it's getting better, like I said, and it will get there. 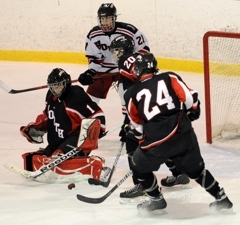 Fortunately for Duluth East, Randolph and Toninato are flourishing in their roles. “Dom's been playing really well,” Randolph said of Toninato. “He's been setting me up for a lot of goals, and he's been having a great season. I've just been fortunate to play with him, and he's done a great job with me. Even with the recent success, Toninato noted there’s still a lot of work that needs to be done in practice. “We're just doing some line stuff -- on power plays he's out there with us trying to get him in that right spot,” Toninato said. “Trevor (Olson) knows where that spot is and Ryan (Lundgren) is not used to it so getting him in that spot really helps. And just communication, that's key. With continued work during the week and more team-bonding bus rides across the state, it seems as though there is little to worry about in regards to Duluth East’s top line. After defeating Lakeville North 4-1, and before hopping on the bus for a three-hour trip back home, Duluth East coach Mike Randolph took a few minutes to speak with the MN Hockey Hub about the victory, Trevor Olson's absence and his team's tough road schedule. Question: Following a long trip down to Lakeville, how did you motivate your team to come right out of the gate and how do you think they performed? Answer: I think having played our last game against White Bear Lake, we didn't feel like we played the way we can play and the way we want to play. I think the guys on the way down thought about that and we talked about it at practice that we gotta get back to our game and I thought we did. I thought we played pretty steady throughout the game and the second period we could have broke the game wide open but we missed a lot of golden opportunities and they still stuck with it, came out and had a solid third period. So it was a pretty good team effort for three periods. Q: What were some positive and negatives from this victory over Lakeville North? A: I thought we played three solid periods. Second period we had a number of great looks off our entries and we just didn't bear down. That's probably the only negative -- I thought we lost a little concentration because when you get looks like that you have to bury the puck. That's about the only negative I'd take away from it. Other than that I thought we played pretty solid in our end, blocked shots, and really kept things on the outside particularly when we never play on this big of a sheet. 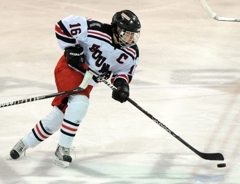 Q: A tough scenario losing senior forward Trevor Olson from your top line until mid-January 2012 to an MCL tear. How has this team responded to his absence? A: We just have had a lot of guys step up with probably our best goal scorer out in Trevor Olson. It's just been nice to see the kids fill the void. We're missing Trevor -- not only his physicality in the game but his ability to put the puck the away. I think it's been good and it will make us better in the end, make us deeper and a lot of kids have stepped up the first six games. We're anxious to get Trevor back though. Q: For a second I thought there had been an error when we saw this away game at Lakeville was scheduled early in the season on a school night. You have a lot of tough games coming up and several of them are down here around the Twin Cities. Why the travel heavy schedule? A: All of these games are on the road and I think it tests you on the road. Just getting on the bus, getting home late and getting up for school the next day -- there's a reason we do this. There's a reason we're down here right now. It's late and we're going to get on the bus and get back probably about between 12:30 a.m. and 1 a.m. and they're going to have to be in school and we're going to practice tomorrow. Then we're going to have to go to Cloquet on Thursday (Dec. 15). We gotta come down here and play Minnetonka, we gotta come down here and play Burnsville, we gotta come down here and play (Eden Prairie), we gotta come down here and play Maple Grove. I think the schedule builds to where we're going to get some confidence, get used to playing on the road and we're going to go into some really tough places in January and obviously the Schwan Cup. It's a process, it's day-to-day and we want to stay healthy and get better. I think we're getting better and playing pretty consistent hockey. After replacing Randy Schmitz at the Lakeville North helm, Panthers’ first-year coach Trent Eigner is not intimidated by top-ranked teams. Following the 4-1 loss to Duluth East, Eigner spoke with the MN Hockey Hub about the tough matchup against the Greyhounds, the play of senior goaltender Shawn Hart, the upcoming season and his inaugural year on the job. 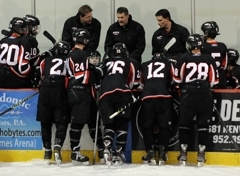 Question: With this being your first year as coach, what went through your mind when you saw you were hosting the 2010 Class 2A state runner up and current top-ranked Duluth East? How do you think your team played? Answer: In our circumstances with a new coaching staff, I was thrilled to see we were going to play them for a number of reasons. Your kids can learn from a team that plays the game the right way and they do in a lot of senses. Sure they're talented but they play hard, they work hard, they compete. Our kids needed to see that because that's part of what myself and our staff are trying to create here is to get our kids to see that there's a level you need to have if you're going to be successful. I didn't mind having to play them and actually I really looked forward to it and the kids did, too. With that being said, it doesn't make it easy. I felt that at times early in the game we competed very well. As the game wore on, their skill just continues to create opportunities. From our perspective, we just look for that level in our guys and I think they did a good job of that so I think we took a step in the right direction even though it wasn't on the scoreboard. Q: A couple quick goals against your starting goaltender Jake Anderson on not many shots. What made you go ahead with the goalie change to put in Shawn Hart? A: The change was initiated by the (starting) goaltender himself -- Jake said he tweaked his groin so we made the change. Q: You must have been well-pleased with Hart’s performance then. What did you think his ability to come into the game and his play? A: That's one of the real positives that the coaches and I talked about. Shawn (Hart) came in and did a great job. For a guy who hasn't seen a lot of varsity action, I think it might be one of them little stepping-stone games that gives him a little confidence the rest of the way. You look at the positives you can take away from a loss and that's one we talked about. Q: Does the performance give Hart the nod on Thursday, Dec. 15, against Eagan? A: Just as I tell my other players, you earn your ice time. (Hart) definitely earned his playing time so whether it be next game or whenever he definitely earned a shot to get back in that net. I think it might have been a situation where last time he got the start he actually started a little bit shaky and I could tell he was searching for his confidence. Where this time, maybe he didn't have a chance to think about it -- next thing he knows he's in the net and he just reacted and played very well. He definitely did the work necessary to earn another start for sure. 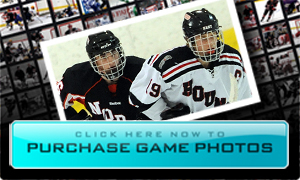 Q: With playing in a talented South Suburban conference, how much does a game like this help? A: I'll take these matchups all day before playing any kind of weak schedule. I'm thrilled that we play in this conference. We need to build to get to where the Eagans are, and the (Lakeville) Souths are, and the Burnsvilles are and those are the teams you want to try to play on a nightly basis. It's fun to compete. I'm thrilled we play the type of schedule that we do. Q: On a more personal note, how has this first year at Lakeville North been going for you? Is there added pressure with the Panthers having success during recent seasons within Section 1AA and making state tournament appearance? A: I'm obviously thrilled with the opportunity. I think that's part of peeling back the onion a little bit. (Former Lakeville North Charlie Lindgren) had a big part of a lot of the success that went on here in the last three years. I think when you take a look at how the team competed against quality teams last year, there wasn't a lot of success there. Anytime your success is heavily predicated on one player, it's kind of a fragile egg because now that guy is not here. I would love to have him back in the nets but that's not the case. I think realistically we want to build this thing the right way. It's kind of said without being said, you never want to be the token visitor to the state tournament. When you get there, you want to have a legit chance at winning that thing. To do that, we've got our work cut out for us, but games like tonight and competition like tonight is how you get there. 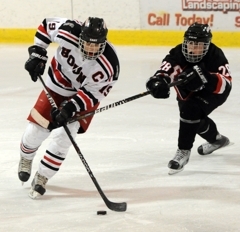 Senior forward Jake Randolph had a goal and three assists to lead No. 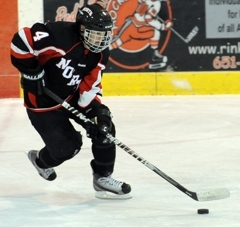 1-ranked (Class 2A) Duluth East past Lakeville North 4-1 on Tuesday, Dec. 13, at Ames Arena in Lakeville. 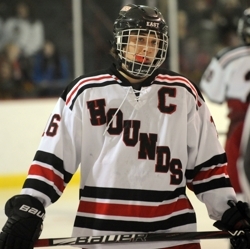 Meirs Moore, Nate Repensky and Dom Toninato also scored for the unbeaten Greyhounds (6-0-0). 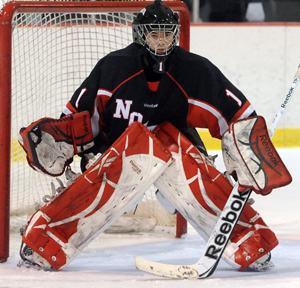 Dylan Parker finished with 12 saves for Duluth East. Following Moore's first-period power-play goal -- the second of the game coming on Duluth East's third shot -- Lakeville North starting goaltender Jake Anderson was replaced by senior netminder Shawn Hart. Though Anderson's save percentage may have aided the decision, it was a tweaked groin that led to the goalie change. Hart stopped 26 of 28 shots and frustrated both Randolph and Duluth East's Conner Valesano on breakaway opportunities. 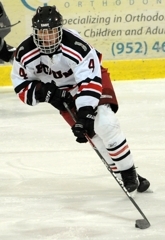 Blake Winiecki was the lone goal scorer for Panthers. 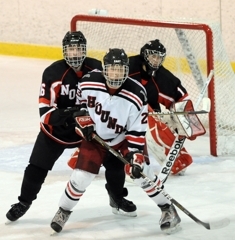 Things aren't scheduled to get any easier for Lakeville North (2-2-0) as the Panthers play No. 4-ranked Eagan at 7:15 p.m. on Thursday, Dec. 15, in a South Suburban Conference clash. Duluth East (6-0-0) will head back to the road again on Thursday, Dec. 15, traveling to Cloquet/Esko/Carlton for a 7:30 p.m. Section 7AA matchup. Recording a point on each of the Greyhounds' four goals (one goal, three assists), Randolph had a monster night. 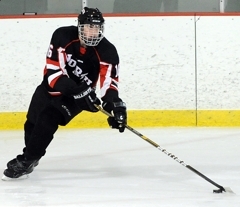 Though the senior co-captain constantly captivated Lakeville North's attention throughout the night, often it would be the second or third Panthers' defender to stop Randolph from creating yet another scoring chance. Collecting two points (one goal, one assist) along with solid play on defense, Repensky showed the impact he can make. Shutting down Lakeville North's forwards and keeping the puck out of the Duluth East end, Repensky was a large reason why the Greyhounds outshot the Panthers 16-4 in the second period. After watching the game's first 6 minutes, 54 seconds from the bench, Hart replaced a hurt and struggling Jake Anderson (the Panthers' starting goaltender) with the task of keeping the game from getting out of control. Hart only allowed two goals to the No. 1-ranked Greyhounds -- one of them being a result of a point-blank shot off a turnover by a Lakeville North defenseman -- and the senior goaltender finished with 26 saves. Two of those stops were made on breakaway opportunities by Jake Randolph and Conner Valesano.